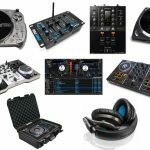 The best DJ equipment and gear out there will of course depend on who you are as disc jockey, however as technology continues to grow, so do our choices when it comes to not only getting started on our DJ adventures but also upgrading our current setups to increase our work flow and abilities to spin and mix. We remember the day we were given our first DJ turntable and mixer with some old records our parents bought off Craigslist (well, the gift was from ‘Santa’) — we were hooked the instant we put that needle into our first vinyl groove. This has since evolved into today with our research and numerous reviews on popular highly rated DJ gear around the market. Today however, we wanted to create an evolving guide that we’ll continue to update as we see fit, and also provide our readers with an all-in-one shopping guide and review on all of our favorite pieces of DJ equipment and gear in the world. Let’s get started! When it comes to buying the best DJ gear, and especially in a guide as huge as this, there are going to be a lot of “it depends” we’ll be throwing around. We’ll first start with who you are and the “level” you view yourself as. 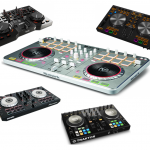 If you don’t have any equipment yet, are learning how to start DJ’ing and want to get going on the essentials, you’ll have to start small — grabbing two affordable turntables and a mixer will suffice, or if you’re into a contemporary and more digital-focused setup opposed to the traditional method, grab a DJ controller and some DJ software and you’re good to go. Our beginners DJ equipment article may be better off for you right now, otherwise, we’ll keep going here. 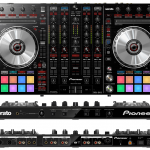 On the other hand, if you’re already a DJ and are experienced with some gear in your repertoire already, it may be time to upgrade here and there. Or perhaps there’s additional DJ equipment you don’t have yet and feel you can benefit from if you add it into your workflow? Perhaps you’ve already purchased your DJ laptop or computer you’re starting to evolve and feel it’s worth investing in something more high-end than you already have? We also want you to keep in mind what your targeted audience or setting will be as a DJ. As with all live performance equipment, this can be very broad, and spans all the way to in-studio DJ’s who make and produce music, to those who travel and gig at weddings, venues, parties, churches, community events, and more. The reason why you need to keep in mind your “DJ audience and setting” is because it may determine what DJ gear is best and essential to focus on first, or at least prioritize to upgrade while you’re here. For example, if you’re in the studio adding some scratches or tweaking a sample for your tracks, a speaker PA system or some lights aren’t going to be something you need or consider as the best DJ equipment. Focusing on investing your capital into a better DJ controller, turntable or mixer will be key instead. On the other hand, weddings, bars, stages or general venue DJ’s absolutely need some headphones to blend in their tracks, a rack to set it all down on (and case to transport it), and a tip-top speaker system to portray their sounds to their audience (unless of course the venues you play at will provide a system, but we wouldn’t bank on every single place providing this for us, especially if you do this for a living or foresee yourself performing or mixing at various settings throughout the year — each place depends). With those factors being said, we’ve provided a small table of contents below to allow you to skip ahead to a particular piece of DJ equipment. Before you continue, let us know in the comments if you have any questions or concerns, or if you feel you need a recommendation for something we haven’t provided yet. We’ll be sure to add it in future edits. 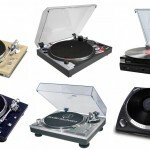 Let’s start off with what we feel defines ‘DJ gear’ in it’s most important form – a turntable. 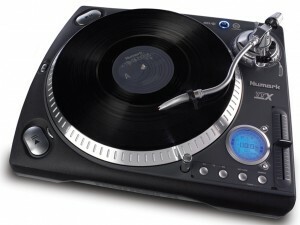 Without one of these, DJ’ing probably wouldn’t exist. 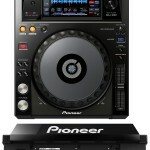 Our first pick is a very popular and highly rated model by one of our favorite DJ brands of all time. Designed to simplify your recordings, the PLX-500-K offers a unique layout that produces a high-quality vinyl sound. Equipped with optimal vibration damping as well as accurate audio playback, this is going to give you that chilling feel when you’re playing your custom beats or favorite records. This piece of DJ equipment comes as a high-torque deck as well as its custom rekordbox software, so in case you need some software to go alongside the table (we do recommend our software pick later in the guide, however), you can simply use the USB plug-in and better keep track of your digital recordings. On top of it all, the turntable also allows you to record your vinyl collection to custom-made digital files to your PC or laptop computer if that’s something you fancy (this will come in use, trust us). Scratching of course is beautiful with this turntable as well, so you really aren’t missing any of the essentials. Regardless if you are an amateur professional DJ or simply enjoy recording for fun, it all starts here. We do recommend buying two if you’re going to be into mixing and blending songs, although it can get costly if your budget isn’t too high since it isn’t sold as a pair. 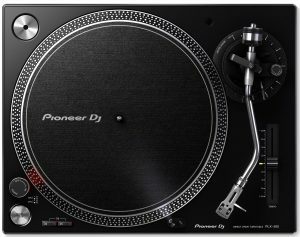 Regardless, the Pioneer DJ PLX-500-K offers more than just your high-quality features in a turntable, which is why we consider this first as a top pick for the best DJ gear being sold today. If you weren’t feeling the previous turntable pick and wanted something a little more budget-friendly, here’s a nice one that’s giving us a mixture of both contemporary and traditional feel at the same time. Scratching isn’t quite as nice with this one but you can still get it done. The TTUSB also allows you to create digitized vinyl recordings with ease. Jam packed with so many other essential turntable features, ranging from superior anti-shake controls for better balance, all the way to USB computer connectivity, this is a nice choice and reviewed highly by many. Featuring Line level RCA outputs with a built-in preamp, the table offers you expanded choices for connecting with the sound you are looking for. In today’s day in age the USB connective accessibility is paramount for the recorder, as everything in modern-day music runs through computers. If you are more of a simple musician or enjoy recording for fun, let the Numark TTUSB take control for you as it comes packaged with all the cables required to connect with your computer as well as a stereo playback system to give you best of both worlds. For mixers, we wanted to immediately jump to a high-end, powerful piece of machinery to keep that backbone of the best DJ equipment list going. 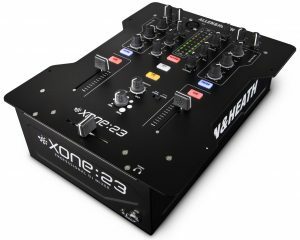 A new and improved updated version of the XONE 22, this Allen and Heath product (they’re famous for their higher-quality DJ gear) is still meant for beginners who are looking for a dedicated high-performance mixer. Updated and significantly improved headroom, the XONE 23 increase its db from 8db to 20db, as well as an increased master output from 25db to 28db. Equipped with a brand-new resonance dial as well as a VCF filter system (essentially the processor of the mixer to control voltage and amplify your sounds), this is a DJ mixer that has low-pass as well as high-pass filters, plus frequency and resonance controls. Whether you are trying generate higher quality in your recordings or would like the optimal way of controlling two turntables at once for scratching and mixing, this is a mixer that offers just about everything when it comes to necessary features. In addition, the 23 mixer now offers a power switch on the rear of the mixer as well as new multi-color effects buttons for added efficiency. Finally, this mixer comes with innofader compatibility and a balanced mic input. It’s safe to say that not only is the Allen and Heath XONE 23 an upgrade from the 22, but it has without a doubt established a stance in the talks of the best DJ gear around today. For more of a standard, less bells and whistles and quite cheaper solution to a DJ mixer, we love this pick. The M2 is a 2-channel DJ mixer that allows you to be yourself and completely customize your recordings and control the essential settings of turntables and an overall mix. It’s quipped with a three-brand EQ as well as gain on each channel, giving you the basic essentials that are required to capture the attention of your audience and the optimal choice for you scratch DJ’s out there since the fader is super slick on top of it all. The Master and Record (RCA), as well as the two phono/line switchable not only make this an incredibly accessible mixer, but also help you to more easily craft your sound. No USB here, but that isn’t necessary with a mixer unless you were planning on syncing it up with your DAW — these are typically for more traditional DJ setups with two turntables and a mic. The switchable phono/line inputs are best utilized for turntables as well as CD players, but that’s not to say you can’t use it for just about any other source. 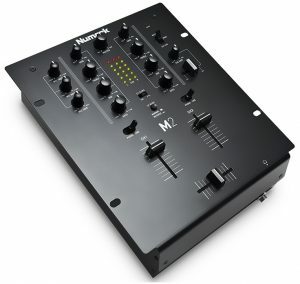 Don’t miss out because the Numark M2Black is one of the more popular mixers out there that won’t break the bank. Now let’s talk new-age. Or really, what most DJ’s are using nowadays (don’t get us wrong, both traditional as well as contemporary are fine with us, and many DJ’s we’ve spoken to go both ways). If you’re unfamiliar with what a DJ controller actually is, we recommend our guide we linked to up there. In sum however, this is essentially two turntables and a mixer combined into one unit that syncs up with your software to control not only what you’re playing, but the FX, tempo, and quite honestly all settings you’re able to think of when it comes to sounds in general. At this point in the game, Native Instruments has a love hate relationship with many in the DJ gear world. Some despise the fact that their controllers are only specific to their software (although the controllers can work with other software, but will lack certain features that make this even worth the price). Others however stick to only N.I. gear because to be honest, it works amazingly. With that being said, the S2 is a great choice regardless of if you intend to use it in the club, at a wedding, or in the studio — it applies to all settings and uses. The layout of this one is designed for optimal software integration (more specifically their beloved Traktor DJ, a big competitor to Serato), so that you have a super convenient workflow and accessibility to your sounds and settings. Simply plug and play it into your PC or Mac and get going immediately, and if you’re into smart devices, the S2 now allows you to have an easier time connecting to your iPhone or iPad as well. You can scratch with this one, hold 2-channels, tweak FX, assign certain sounds and FX to knobs and buttons, and more. This is a controller that is relatively cheaper in price as compared to other N.I. gear in their toolbox. 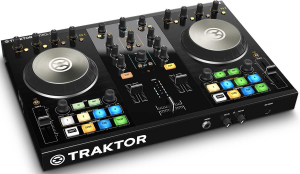 The NI Traktor Control S2 is simply the best when it comes to authentic and quite honestly, powerful controllers. You can’t go wrong with N.I. Steering away from a controller that’s only recommended for those who use the software that comes with it, we’ll look into another powerful standalone DJ controller that’s highly rated by many who use it. When it comes to premium 2-channel DJ controllers, the DH MC4000 is simply incredible and makes its way as one of the best DJ gear picks to choose from. Continuing in its innovative ways, the DJ MC4000 features a 2-deck Serato DJ controller (recommended with it, at least). You have touch-activated jog wheels for custom cue of tracks and scratching, a dedicated hot cue for trigger pads (illuminated as well), 100mm pitch faders, balanced outs for some speakers (independent level control — very convenient), 2 balanced mic inputs in case you want to use them for performing or performers, and an overall steel construction to give us a sturdy and longevity-focused investment. This is a controller for professional DJ’s yet a great choice for beginners since it has a learning curve to it and includes a copy of Serato DJ Intro if you’d like to test out the software before you use it (coincidentally is listed next) — you can then upgrade to the full version of Serato when you start getting the hang of it. 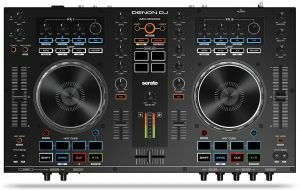 Make the Denon DJ MC4000 your one stop shop, and allow it to do most of the work for you while allowing you to best utilize all your favorite settings — oh, and to scratch too, of course. Serato completely changed the game when they first came out in 1998. 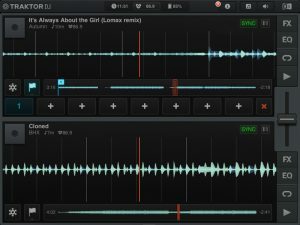 As we had mentioned previously, DJ software is typically the Traktor vs. Serato debate and it’s quite a split. 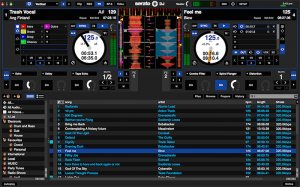 Serato DJ has no shortage when it comes to features that will enable you to completely control your sounds, settings, FX, mixes and more as a DJ. Although way too many features to know, some of our favorites include virtual decks that sync with your controller, colored waveforms, MIDI support, crazy FX (made by iZoptope — filters, echoes, delays, reverb), recording and sampling, and more. This award-winning software also comes with library compatibility that allows you to integrate with libraries such as Pulselocker, iTunes, as well Serato’s crate storage system allowing you to properly organize your library. The reason why that’s important is because you can scratch any song that’s on your computer — you are no longer limited to only vinyl. Don’t be afraid to take a financial risk with Serato DJ, because not only is DJ’ing software growing in popularity among professionals but it is well-known for making or breaking your recordings. The best DJ equipment setup is nothing without software if you’re going the technological route. You’d be surprised at how many DJ’s nowadays are either using an iPad to get their work flow going or even their phones to power and control all of their gear. While we don’t recommend it for semi-pros or professional DJ’s, grabbing a DJ app for cheap can not only be useful for those looking to get a mobile setup going or merely having fun on the side to mess around with some sounds when you’re bored. Our favorite DJ app came out to be Traktor DJ; unfortunately it’s only available for iOS and not Android at the moment. You can read our guide for more picks if you are indeed interested in some mobile DJ’ing. To get to Traktor’s features and why we like it so much, let’s see what the standouts are. You have “touch the groove” for swiping and pinching, 3-band EQ, filters for each channel, direct access to your iTunes music, ability to loop as well as scratch, and numerous other side-features to help you not only tweak the sounds of your mixes but play around with the style as a whole. Traktor DJ is awesome and super capable, well out of the league of many other DJ apps out there. Not to mention for only a few bucks? It’s more of a why not. For those who mash-up and mix their songs on-the-fly (although many DJ’s nowadays do this before a gig in their studio to create a playlist to avoid any chance of error), know how important DJ headphones are. Not just any ‘headphone’ will do either — there are a few needs we feel DJ headphones call for: swiveling ear cups (90 degree so you can free up an ear and keep one enclosed for mixing), foldable for travel, great comfort (no pain, please), and overall clear and precise sound quality. 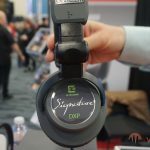 This particular headphone is not only versatile in terms of its multi-use capabilities, but it offers heightened frequency responses that enable a high-quality listen and overall DJ workflow. These over-ear, high-output headphones include threaded 1/4 inch gold-plated adapters, replacement ear pads, and a convenient carrying bag for when you’re on the road. If you are involved in the DJing experience, you should know by now that having optimized headphones can make all the difference. 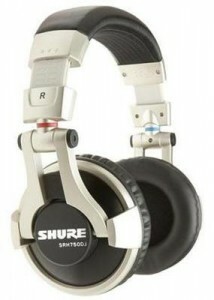 Let the SRH750DJ do it all for you as these headphones are some of the best DJ headphones in the market. Detachable coiled cables allow added convenience, so that you don’t need to feel as attached to your mixer and have a little bit more mobility. Simply put, these reasonably priced Shure SRH750DJ are a no brainer and can work as studio headphones or leisure listening as well when you’re taking a break from spinning. 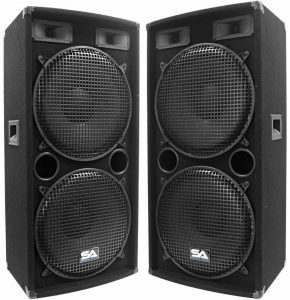 If you’re a DJ who is going to be required to bring their own PA system and speakers to their gig or venue (wedding spots especially don’t always have their own system), these are a must. Simply put, the Seismic Audio-SA 155.2 are some of our favorite DJ speakers that are going to amplify your sound like no other. If you are trying to control your audience’s attention, these speakers allow your DJ experience to have little issues as its two 15 inch woofers (50oz magnet with a 2″ voice coil) have great strength to get that bass up and pumping. In terms of power, they’re quipped with 500 Watts RMS as well as 1000 Watts Peak, proving this is a powerful speaker and is in the mix of some of the best DJ gear when considering how impactful a high-quality speaker can be for your overall set — it can make or break it. Two 2 x 5 tweeters are also in that build for your high-ends and steel grills over each speaker make this speaker a great choice for all small to medium-sized settings you may find yourself DJ’ing in. The build also includes a terminal cup with two 1/4″ inputs, 5/8 plywood front panel, and pocket handles to carry them (weigh about 51 lbs. per cabinet, so you may need some help carrying these things around). In terms of dimensions if you’d like to keep this in mind before you buy to foresee your setup, they’re 38″ tall, 16″ wide, and 12″ deep. The Seismic Audio-SA 155.2 are beastly yet sold as a pair for an affordable price to get going on those DJ performances. This may not be what some think about when the best DJ equipment is spoken about. 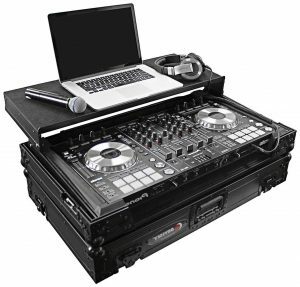 Yes, any “table” will do, but you’d be surprised at how great it feels to be able to not only store your DJ gear (most of it, of course) into a nice and convenient case but also have that be able to fold into a well-organized space to get going on using all of that DJ gear you purchased. Cue in DJ stands, racks and cases — since there are so many out there, it was tough to just choose one. This one however is one of our favorites since it’s relatively affordable (at least compared to the other higher-quality all-in-ones) and very efficient for storing not only a huge DJ controller or two turntables and a mixer, but also a laptop up top and a little extra space for headphones, a microphone or any other accessory or item you need to place (your phone, or hey, perhaps a drink?). This one is quite large and won’t fit as a carry on for airplanes, so if you’re traveling far for a set or gig and need to bring it along, keep in mind you’ll have to store it underneath (and that gear can get costly, so just be careful). The Odyssey FZGSPIDDJSXBL is our favorite DJ stand and case — we just hope it has enough room for you and your gear. Also keep in mind wherever you play your set you’ll have to find a table to place this on since it doesn’t have its own set of legs. You may or may not be able to get a light show as tip-top as somebody like Kaskade or The Chainsmokers. However, a little pizzazz goes a long way depending on the setting you’ll be DJ’ing in. For weddings, probably not. Parties however, it’ll only help give you some flair and if you do end not feeling it, you can always turn them off. This particular pick is a great party light choice whether you are looking to capture the attention of your audience at a club, a party, or a company banquette. Equipped with 3W party lights, these DJ lights turn on instantaneously when plugged, and more impressively change as the music changes. 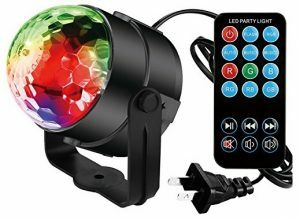 These DJ lights come in various different colors red, green, blue, and a combination of all three at the same time which can be controlled with a remote located on the wire of the unit. One of the most impressive features is the lights auto mode that will automatically change the color of your lights once plugged in. Operation mode is not as common as you might think in a DJ or disco light, so the KINGSO DJ Lights make for a great exception. They’re not necessarily programmable like professional light shows, but they’re durable and first in its class. Not to mention it’s super cheap to where you can buy as many as you need.